Day 298 in Beijing: Jill Loeffler, Professional Journalist. 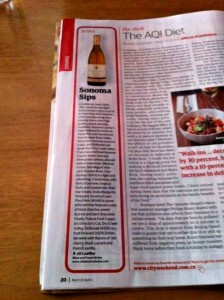 Sonoma Sips by Jill Loeffler! Jill has her own websites, SF Tourism Tips and All About Red Wine, but has wanted to expand her reach here in Beijing. 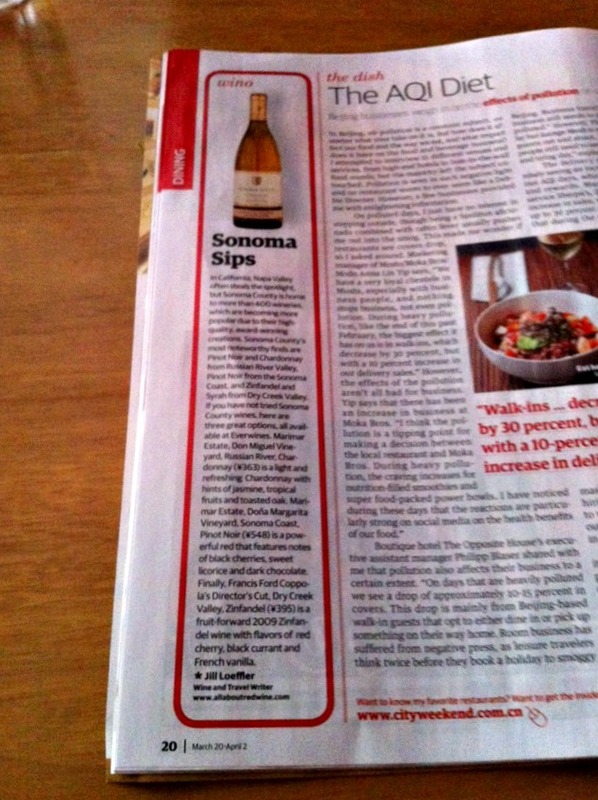 So, our dear friend, Sarah Ting-Ting Hou connected her up with the City Weekend: Beijing magazine and she was asked to write a 180 words blurb on Sonoma County Wines. Sarah actually wrote the article about Air Quality in Beijing right beside Jill’s article. How cool is that!?! Jill spent a day or two, and I spent a day also, looking for Sonoma County wines here in Beijing. It seems that American wines are very heavily taxed, while Chinese, Chilean, Australian and some other countries wines are not. France’s wines are but they are well known and therefore easier to find. It was almost impossible to find Sonoma County wines. When she did find them, it wasn’t a large selection so she did the best should could to get a decent selection. I’m proud of her and that she is now a published journalist in Beijing, China.